There were only 6 apartments within 20 miles of my work that would accept my furry family and were within my price range (the combination was lethal). As I mentioned in my 3/31 blog, 2 complexes turned me down straight away. Since then, I found out that option #3 wouldn't take Nonni because she was 3! lbs over their limit. Out of the remaining 3 choices, one wasn't going to be available until June! That narrowed it down to 2. Out of those 2, one wanted an $800 pet deposit plus a $300 move-in deposit (and of course the 1st months rent would also be payable at move in), AND only $500 of the $1100 would be eligible for refund whenever I moved out! I laughed. If I had THAT kind of money, I wouldn't be moving into a $400-$500 apartment. In fact, I wouldn't be moving into an apartment at all! Me and my babies would be moving into our RV! So, that left "an" apartment. There are some great things about the place I found, and I share them with you below, but first I have to address something that keeps coming up. I have been blasted by more than a few for insisting on keeping my furry family when I can't afford "proper housing" for them. It doesn't seem to matter to these people that not too long ago I had a 3-2-2 house on a corner lot with a huge back yard. It's not like I acquired my babies while living in a tiny apartment. I know I no longer have that house or that backyard or a high-paying job or a new car every year or even my husband for that matter. What I do have is excellent health (Thank You, God! ), a great job that offers benefits and 3 absolutely incredibly fantastic furry babies. I am blessed. I know that I am taking 3 animals to a small apartment. I get it. But give up my babies? Especially after all we've been through together? Never! The units are painted fluorescent orange and bright lemon yellow. The cashier at the convenience store next door is in a glass booth, surrounded by metal bars. I won't even begin to talk about the staggering clientele that come out of the "outpost" bar next to the caged store. And my confidence level certainly wasn't bolstered when I went after work to give them my deposit, and saw what undoubtedly was a drug deal taking place in the parking lot. By now, you probably think I'm crazy, I assure you I am not. You'll see why when you read the many good things listed below. What I am is determined to make this downward spiral stop. It has been a roller coaster ride and I need the dust to settle. I have got to get stable and I have got to get back on my feet financially. It will take awhile to get caught up, and get things turned around. Then I can really start making some headway toward getting my RV one day. I am tenacious if nothing else. I have my health and my furry babies. Life is good. All is well. It is only 2.1 miles from work. If Betsy (my '93 Buick with burgundy velour seats) breaks down, I can still make it to work. Very important. It is only 2.7 miles away from a leash free dog park. Yippee! We went there today. Nonni is very polite and does her best to give me a good picture but she wants to go play! 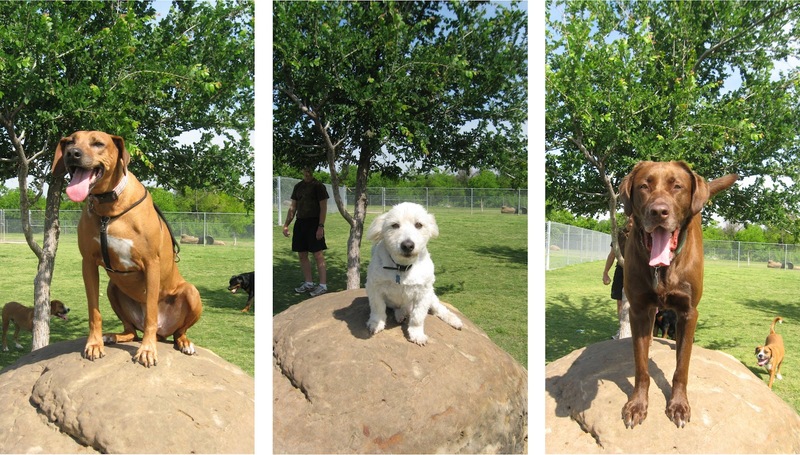 Bentley poses but says, "Mom, this rock is really high!" And Delilah, their new friend who kept playing queen of the hill, says, "It's about time you took my picture!" The management at this complex rocks! The complex has been under new management for about 3 months now. I have complete confidence in this team. Here's a picture of Tammie and Danielle - they are uber fantastic and I am looking forward to getting to know them better. 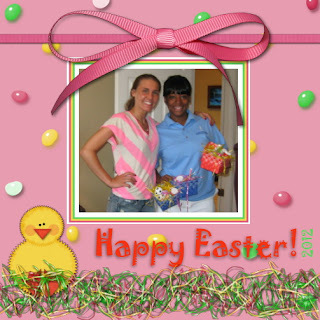 They were in the office today giving out Easter baskets to all the kids. It was all so adorable and the kids were so excited. And of course, Nonni and Bentley were a big hit with the kiddos. When this place says "pet friendly" they really mean it. 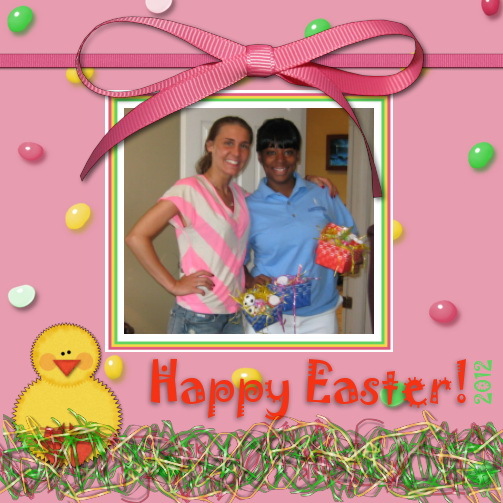 Before we left, Danielle even gave Nonni & Bentley treats that they keep right there in the office! Needless to say, even though not having their backyard and doggy door will be an adjustment, the dogs are going to love living here. That makes me happy in and of itself. They have been such troopers through all of this, and their sweet love got me through a lot of hard days. The living room has hardwood floors - perfect for scrapbooking and crafts, and the babies. It is a bottom floor, which again is convenient with the dogs. It may be bright orange and yellow, but it's kind of festive, and it's just paint, right? The grounds are well kept and there's no trash, junk, etc. THE apartment is on the back side, away from the parking lot. It's on a corner next to a greenbelt of sorts, and has a humongous oak tree outside my window. The sidewalk ends before you get to my windows so I should have very little traffic. For those of you who know me well enough by now, you know all of that is a very good combination for me. I can see myself writing in this apartment. In fact, I almost listed this benefit first. If the outside environment is too loud, I can always use earplugs but THE apartment itself is conducive to writing. I couldn't say that about the other apartments. Far better writers than I ever hope to be started their careers in far more humble abodes. Life is good. All is well. I was devastated, mortified and terrified when I found out that I was going to have to move. My 3/31 post (here) sounded alarming because I was alarmed. It took me forever to find this duplex that we currently live in. NO one two years ago wanted to rent to me and my babies. Richard, my landlord, took a chance on us, and it has been a blessing to live here. It was a nice transition in going from a large home to a small apartment. Moving to Dallas two years ago was a leap of faith, and once again, God has taken care of me every step of the way, albeit one step at a time, but the path has always been illuminated. One of my good friends kept telling me to "Trust!" I need to get better at that. Thank you wonderful readers for being so supportive. After all I've we've been through (my animules included), I thought this might be the straw to break the camel's back. Instead, it's turning out to be another blessing. I truly am Living in Grace. Thank you for being here with me. this is a wonderful post for Easter, which is about New Birth and your life is once again changing. I love the look of the apartments, that is the way most places look here in FL. and the landlords look really special. as for the dogs, they don't care one whit where your live, as long as they have you and food and a place to potty, all they want is you. it would be unspeakably cruel to them to give them away. people don't give their kids away because they can't find a place suitable. get real is what i say. the park is a big plus and think of the gas money you will save being so close to work, you can even run home if necessary for your kids. all your kids want is you and your love for them, think about the skyscrapers in NYC. the majority of those people have dogs and they can't just walk out side their door, they are 40 floors up. this will allow you to save money and i am happy for you. @ Sandra - Exactly! You tell 'em girlfriend! :) The support I get from you and my other wonderful readers keeps me going. Thank you very much MadSnapper. HugZ! AWESOME!! See what a little prayer can do? So close to work...thats great! Doesn't look like a bad place, sort of Art Deco exterior....look forward to pics when you get moved in! I think it looks like a very nice complex and I even like the colors. They look "happy" :) I totally understand about the furbabies too. If I had to move no way would I ever move somewhere that I couldn't take Duke with me. @ Ann - I like thinking of the complex as "happy." Nice! Miss Hope never likes change but one she is settled, I think "happy" will describe the 4 of us perfectly. :) I hope you've enjoyed a wonderful break. Happy belated Easter! I also understand about the furbabies. It's wonderful you can keep your family together and I have a feeling life will change drastically for the better once this move is complete. I like the colors too! I think you've found the perfect place for you and your family! Debra, l understand your position on your pets. Pets become family and friends and l could never part with mine. Your pets don't care where they are, you will take them for their walks and poops, they just want to be with their Mommy who loves them. I'm glad you found an apartment...what would you do with two or three of them anyways (chuckle chuckle). I have to say l have worried about my babies too (two cats). Now that they will be having to adjust to living in a campervan with me. I have to say everytime l come home they are all over me looking for their pats, l think there will be a period of adjustment, but they will adjust. @ Tammy - am so happy for you becoming a fulltimer! I will have to search your blog for pics of the kitties. And just like you said, as long as they have you, they'll be okay. Miss Hope doesn't like change at all, plus she's the oldest, so this will be hardest on her but she wouldn't want to be anywhere else. The way I figure it, the dogs (and I) will go for walks at 5 and 7 - a.m. and p.m., and then just before bedtime. That should "hold" them. LOL. I'm glad to see that you and your family are save.Just loving your "Barbie house".It's the moment to sale your car and biking to work like me. I sale my twoo cars and by a bike. I save a lot of money.For the rv.Courage and "Bonne fête de Pâques". Piouk the cat and i. @ Patrick - Happy (belated) Easter to you and yours, and Piouk too! :) Buying a bicycle is an idea, and would certainly save money, but we've had enough changes for now I think. Plus, I'm in a heavy industrial area - lots of trains and tractor rigs. I could just see me on a rainy day having to go the long way around a stalled train (3 miles to the next junction)! LOL. HugZ to you and beautiful Piouk. @ Trina - thank you. I was concerned too. Must learn to trust our good and great God more. :) "PATIENTLY" wait? Now, that's a different story. LOL. Miss Debra, you may think that I was just a fluke when I first texted you. I can assure you that I am not. I am very much concerned about you, and I am absolutely committed to helping you reach your goal of living in an RV with your furry friends. I am looking and I will not stop until I find exactly what you need and can afford. However, I am so, so proud of your spirit of not giving in to desperation and giving up. Your determination is absolutely inspiring. You, young lady, are very special. You are included in my daily prayers. WIN!